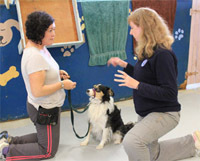 At Pawfect Behaviour we offer private obedience training for you and your dog, and we come to you. Training in a quiet, familiar environment offers less distractions for you and your dog, so you can both be more confident while having your training. We realise all handlers and their dogs are different, so we work out the method that works best for you both. Lauren has experience in providing help with behaviour problems such as separation anxiety, fear aggression or socialization issues. She had done a lot of work with rescue dogs – helping them adapt to their new handlers and new home environment.